Today's Bouquet is a product of sharing my artisan bouquets made from heirloom flowers in my garden with my friends on Facebook. My bouquets soon became popular in my local community, and I set-up a website and was in business as a local boutique floral designer focusing on design with heirloom flowers grown sustainably in my backyard or from local farms in the Bay Area. I now have a retail channel at our local artisan market with Today's Bouquet Pop-Up Flower Shop. Today's Bouquet is a channel to express my creative energy and foster my obsession with my garden, flowers, and art. Each artful bouquet expresses my muse of day--reflecting my whimsical and romantic visual sensibility developed through my early career as a curator, art historian, and visual artist. My bouquets are mostly made from blooms grown in my garden in Marinwood, CA, and also with flowers grown locally in the Bay Area. I have been cultivating my garden for over 15 years, and it continues to be a work in progress. I consider growing flowers as my art, and try to make art by arranging them in whimsical ways. 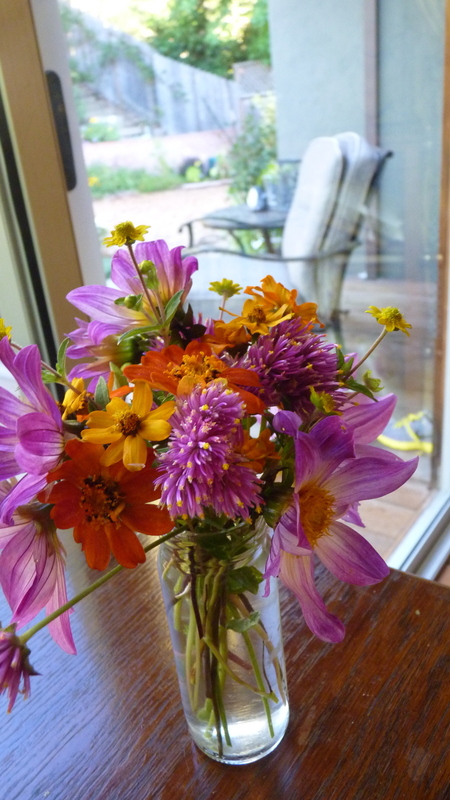 Join me in celebrating the abundance of each day with a garden bouquet!